A humble clerk and his loving wife scrape out a quiet existence on the margins of Tokyo. Resigned, following years of exile and misfortune, to the bitter consequences of having married without their families’ consent, and unable to have children of their own, Sōsuke and Oyone find the delicate equilibrium of their household upset by a new obligation to meet the educational expenses of Sōsuke’s brash younger brother. While an unlikely new friendship appears to offer a way out of this bind, it also soon threatens to dredge up a past that could once again force them to flee the capital. Desperate and torn, Sōsuke finally resolves to travel to a remote Zen mountain monastery to see if perhaps there, through meditation, he can find a way out of his predicament. This moving and deceptively simple story, a melancholy tale shot through with glimmers of joy, beauty, and gentle wit, is an understated masterpiece by one of Japan’s greatest writers. 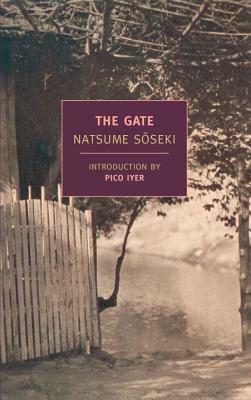 At the end of his life, Natsume Sōseki declared The Gate, originally published in 1910, to be his favorite among all his novels. This new translation captures the oblique grace of the original while correcting numerous errors and omissions that marred the first English version. death from a stomach ulcer in 1916. Other major works to have appeared in English translation include Botchan, Kusamakura, The Miner, and Kokoro. William F. Sibley (1941–2009) was a professor of East Asian languages and civilizations at the University of Chicago. A translator of Japanese fiction and nonfiction, Sibley was at work on Sōseki’s First Trilogy, comprising Sanshirō, And Then, and The Gate, at the time of his death. Pico Iyer is the author of several books, including Video Night in Kathmandu, The Lady and the Monk, The Global Soul, and, most recently, The Man Within My Head. He is a frequent contributor to The New York Review of Books and Harper’s. He lives in Japan.